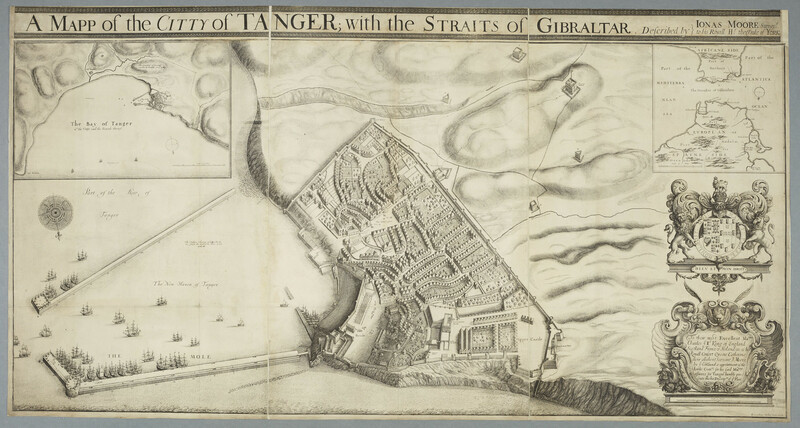 An etched map of Tangier on four sheets: showing the harbour, an inset view of the bay on the left, and a map of the Straits of Gibraltar inset on the right; with the royal coat of arms above a cartouche containing a dedication in the lower right corner. The dowry of Catherine of Branganza on her marriage to Charles II in 1662 included the port of Tangier, on the coast of north Africa at the entrance to the Mediterranean. It was hoped that this strategically located colony would allow Britain to control lucrative trading routes, and provide a base to observe the activities of foreign powers. Jonas Moore was sent to survey the territory in 1663. This four-sheet map, on a scale of about 1:1200, was etched by Wenceslaus Hollar on the basis of Moore's survey. The royal arms dominates the right of the print, crowning an elaborate cartouche containing a dedication to Charles II and Catherine of Braganza. Hollar did not accompany Moore on his voyage in 1663, but six years later he was sent to carry out a new topographical survey, which resulted in the series of etchings entitled Divers Prospects in and about Tangier, published in 1673.